It’s Handmade Monday! As I am not at home I haven’t been very crafty this week so I thought I would cheat and show you something I made before I went in hospital and something small that I made today. Hopefully I will be going home tomorrow, I’m still hobbling around like a zombie but I’m only on paracetomol now and not that plus codeine. I can’t wait to get back to my beads and kiln as well as my none crafty loves. I will be opening my Etsy shop up within the next month too if things go to plan, I need something to keep myself busy while at home or else I shall go up the wall. For my birthday I got a needle felting kit and this an ACEO sized picture I made. There is something very therapeutic about stabbing the needle into the felt over and over. I think it needs something “more” though I’m not sure what. Any suggestions welcome! I know I need to add a bit more wool here and there as it is a bit thin in places. This is something I made this afternoon , I think I may turn it into a keyring when I get home. I have really enjoyed trying needle felting, I will definitely be making more things in the next few weeks. I have to warn you that needle-felting gets very addictive! Lovely colours and the flower is really pretty. I've never tried felting so can't give any advice about that but rest up & get well soon. I love felting but still have not needle felted. You need to have a play with wet felting, it is such great fun... and you end up with really clean hands! 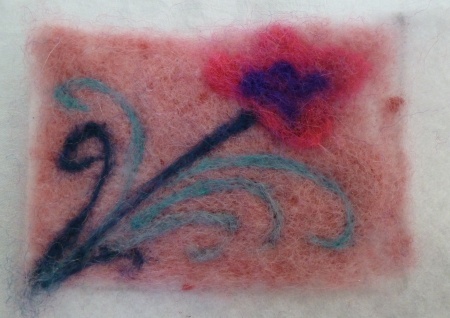 Needle felting is such fun, only I cheat and use my embellisher to make the felt. Great reading about needle felting. I'd like to try this next. 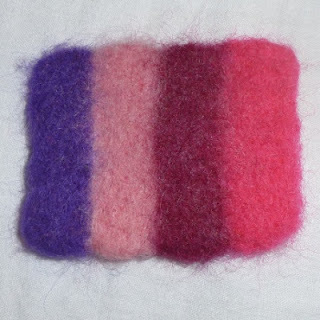 I tried soap felting at Christmas and loved that. here's a link to my blog about it. Get well soon.